So it's January, we should be hibernating. I don't know about you, but I'm still on auto-pilot brushing my teeth and don't really wake up until the second time someone spills their Cheerios or when I hear a cry of despair as somebody can't find their trousers/PE Kit/shoe/pencil with a yellow rubber on the end or other vital school equipment. It's cold out there, I'm bloated from eating tons of chocolate and walking to school in the dark isn't my favourite thing either. Getting up isn't much fun this time of year. I'm not a big one for mouth wash, but my partner is, and so I was happy to agree to review Dentyl Active for him mainly. It became apparent within days that actually the bottles were going down a lot quicker than expected, so the taste gets a thumbs up from some of our teenagers too. I have to say I actually like the Smooth Mint variety myself - not so much the Fresh Clove though - my partner and oldest child were left to fight over that one by themselves. 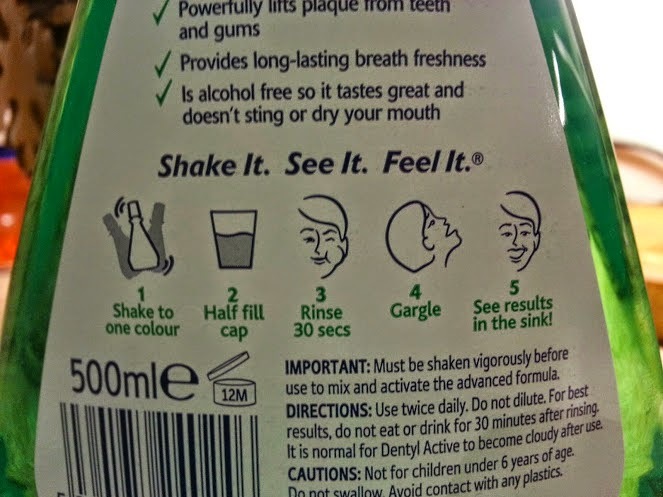 What I found though, is that filling your mouth with mouthwash actually decreases the time it takes to be wide awake quite considerably. In fact, I'd go so far as to say it really wakes you up. 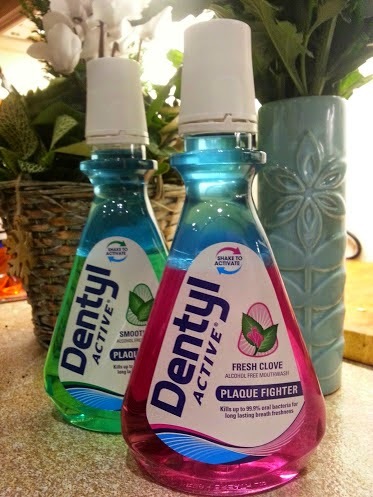 Dentyl Active claims to posess magical properties, or maybe it's just chemicals, but either way it helps lift plaque from your teeth and gums and you can actually see that spat out into the sink. I tried to photograph it, but didn't have enough light, so you'll have to trust me - and probably thank me. This magic only works if you give it a good shake before you pour and rinse. Unlike other mouthwashes we've tried, Dentyl Active is alcohol-free, which is great for my partner as his mouth is quite sensitive, so this is more gentle and won't irritate his gums. Dentyl Active has the seal of approval from the older members of my household (it's unsuitable for children under 6). Both flavours are really well done, although the Clove is really a love it/hate it, and I can't get used to the idea of my mouth tasting like that, although my partner thinks it's brilliant. The freshness does stay for hours, and it really does appear to do what it says on the bottle. 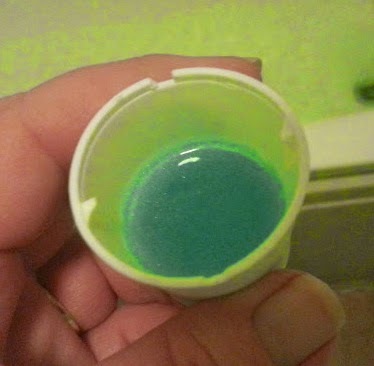 It also does not contain the chemical which we've found my partner's previous regular mouthwash contained, which can actually stain your teeth brown. We'll definitely buy more. Dentyl Active is available at Chemists and supermarkets UK wide, and retails at around £3.30-£3.50 for a 500ml bottle. You can find out more technical and scientific information on their website. I'm wth the mint, it's quite nice actually, although I don't use it every day. My OH has used it for years on the advice of his dentist, and it's nice to find him a nice one that won't stain his teeth - I always thought that was a bit backward! Mouthwash is a staple in our house, especially for the boys. They have a special kids one and seem to be quite excited about using it each morning. Weirdos. I'm s big fan of Dentyl Active and with my gum disease issues mouthwash is a must for me. We've been trying these two and I have to say, I like the mint a lot but I really don't like the Clove one at all. I've used the Clove one for years and always have a bottle in the bathroom. I think its amazing and wouldn't switch flavours. I don't have time to use it everyday but try to use a few times a week. My OH will be mortified if he finds out it's been around for years and he never knew :D Shhhh! Is my husband favourite brand! The flavour is lovely!